Annuals, to 60 cm. 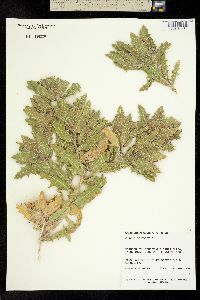 Stems often spreading or prostrate, usually branched throughout, usually reddish, ± loosely tomentose. Leaves mostly cauline, sessile and often short-decurrent or proximal tapering to winged petioles, blades lanceolate to oblanceolate, 6-25 cm, margins coarsely dentate or pinnately lobed, lobes and teeth armed with short, weak spines, faces sparsely to densely hairy with jointed multicellular hairs and slender cobwebby hairs, resin-gland-dotted. 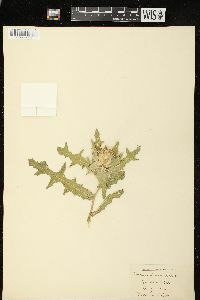 Heads disciform, borne singly, sessile, each subtended by involucre-like cluster of leaf-like bracts. Involucres ± spheric, 20-40 mm. Phyllaries in several series, tightly overlapping, outer ovate with tightly appressed bases and spreading spine tips, inner lanceolate, tipped by pinnately divided spines more than 5 mm. Florets many; corollas yellow, those of sterile florets linear, 3-lobed, not exceeding disc corollas, very slender, those of disc florets 19-24 mm. Cypselae cylindric, slightly curved, 8-11 mm, with 20 prominent ribs, tipped by a 10-dentate rim, glabrous, attachment scars lateral; pappi of 2 series of awns, outer 9-10 mm, smooth or ± roughened, inner 2-5 mm, roughened with short spreading hairs. 2n = 22. Flowering spring-summer (Apr-Aug). Roadsides, fields, waste places, sometimes cultivated; 0-1300 m; introduced; N.B., N.S., Ont. 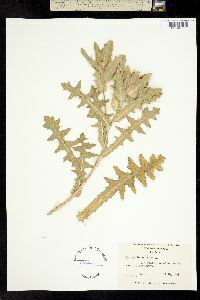 ; Ala., Ariz., Ark. Calif., Conn., Fla., Ga., Ill., Md., N.J., N.Y., N.C., Oreg., S.C., Tenn., Tex., Utah, Va., Wash., Wis.; Europe; Asia; widely introduced worldwide. 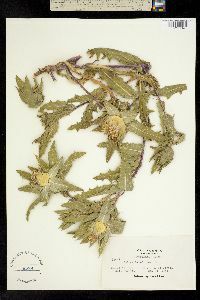 Centaurea benedicta is native to the Mediterranean region and Asia Minor. 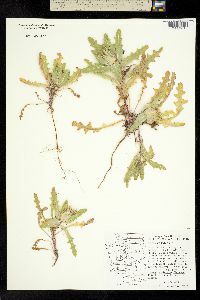 F. K. Kupicha (1975) recognized two varieties of Cnicus benedictus: var. benedictus and var. kotschyi Boissier. A combination apparently has not been made for var. kotschyi in Centaurea. I have not determined whether one or both races are represented in North American plants of Centaurea benedicta. 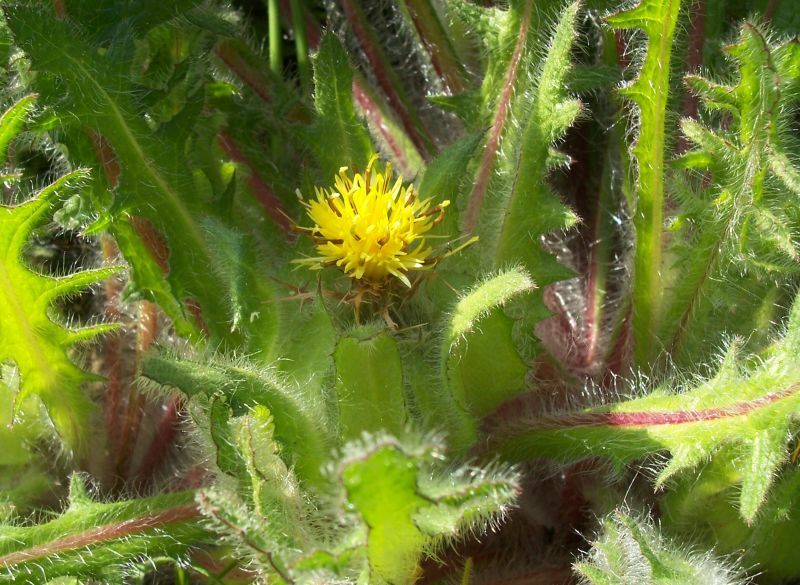 Blessed thistle is cultivated in many areas of the world as a medicinal herb. The leaves, stems, and flowers are all used in herbal preparations for digestive and liver ailments.